Spread a message to Save the Sea, by looking good on the beach in a new eco-fashion line. June 8, 2010, 3:10 p.m. Tired of leafleting and e-mailing petitions for blue enviro-causes? Why not wear an oversized Save The Sea organic cotton shirt instead, preferably off-the-shoulder while walking on the beach with a plaintive expression — always facing against the wind so your hair blows back attractively? Or if you prefer to sit, just make sure you hang your roomy organic cotton Save the Sea tote bag off your beach chair to make the message clear — and keep your back straight while gazing longingly at the ocean. 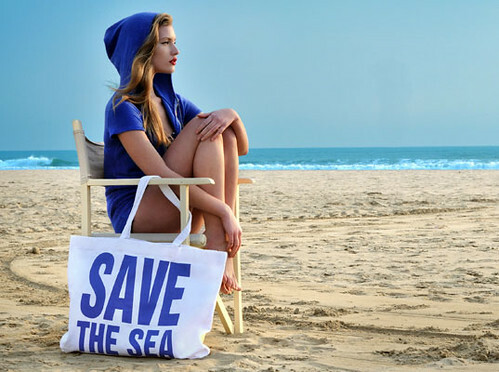 More seriously — the Save the Sea line really does make eco-fashion shopping for the beach easy, since it includes not just T-shirts and hoodies, but also towels, summer dresses for beach parties, recycled polyester swim suits and bikinis. Of course, the bikinis are a bit small to carry for the Save the Sea message in print — but the cute cuts will certainly make an eco-impression during a beach cleanup. The entire Save the Sea line — which includes menswear — is available exclusively at Yoox, with prices ranging from $59 for a T-shirt to $185 for a silk, 1950s vintage-style swimsuit. Spread a message to Save the Sea -- by looking good on the beach in a new eco-fashion line.